The high resolution Laue X-ray Camera allows a digital back-scattered Laue diffraction pattern to be recorded, with a resolution of 1872 x 1280 pixels and 16-bit digitization. The X-ray beam passes through the camera and is collimated down to <1 mm diameter. The active area input dimension is similar to that of Polaroid film, i.e. 156 mm x 104.4 mm. Exposures from few seconds up to >30 minutes can be adjusted during manual or automatic crystal orientation routines before cutting. Twinned structures occurring during crystal growth can be unveiled using a high resolution mode. The standard high resolution Laue X-ray imaging system is a simple solution for a replacement of Polaroid film. Complete systems with real time sensing capabilities can be provided to order including X-ray source, collimation, goniometer and indexing software. Upgrades from existing X-ray sources are made using high precision mechanics allowing crystal orientation accuracy down to 0.05° accuracy. 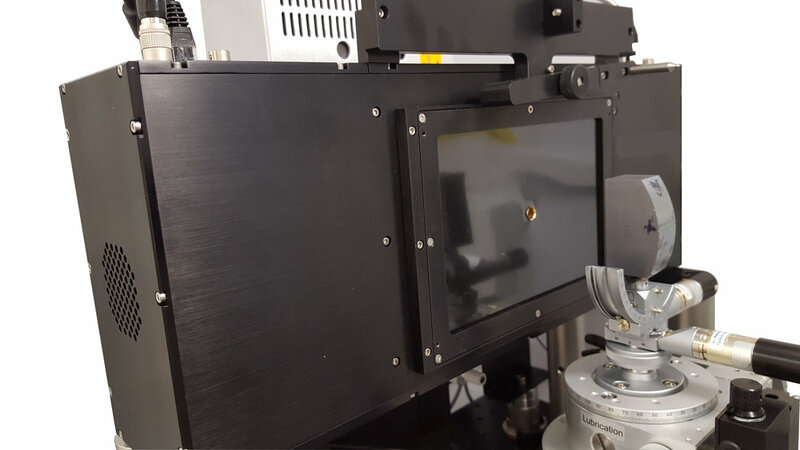 A micro-diffraction set-up for both laboratory and or synchrotron sources can be provided on demand using a very high resolution Laue detector. This solution is also ideal for replacing film-based Laue systems for industrial applications, for example monitoring for imperfections in high performance turbine blades made from single crystal advanced alloys, to avoid poor creep resistance and failure of blades at high temperature. Complete LAUE diffraction systems are also available click here for further information.